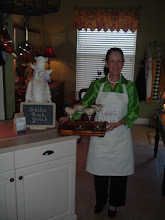 May I introduce to you Miss Nancy, over at Southern Lady ~ Nancy. 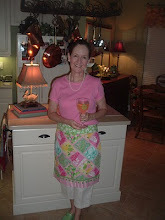 Nancy is a real life Southern lady; she loves the Lord, she loves her family, and she loves her home. That's Miss Nancy in the first photo with her husband. Those are her handsome sons in the photo above. Well, in addition to her wonderful blog, Miss Nancy has an Etsy Shop and she sells darling tassels...I 'm so excited! 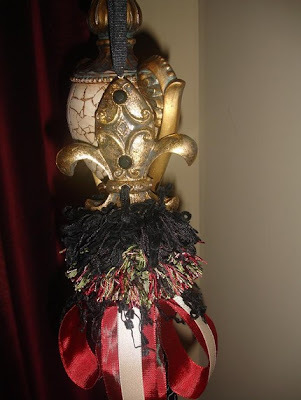 The other day I received my brand new darling rooster tassel...isn't it cute? 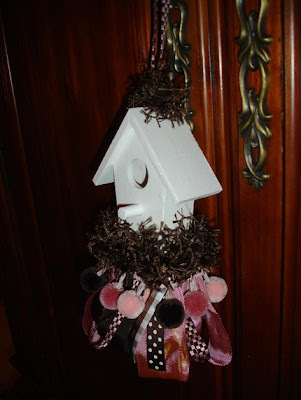 It's just perfect to hang here at "The Roost." Thank you so much Miss Nancy! 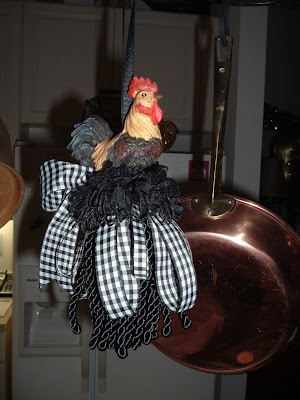 Look at my new rooster...I asked Nancy to add my favorite ribbon--black & white gingham. Now y'all, I name everything, so I've decided to name this girl "Miss Nancy." A beautiful flower tassel...Hmmm, maybe for my bedroom. 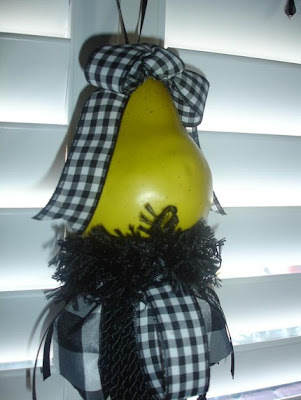 This is one of her pear tassels...This one is my second favorite. 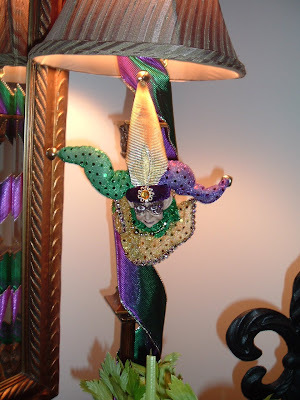 This would make a great Christmas gift--Santa on a tassel! 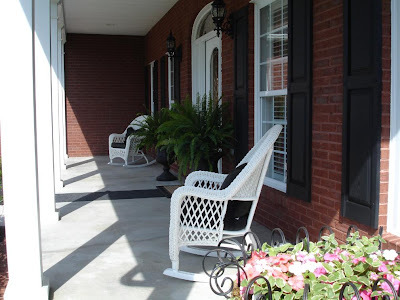 Her front porch...Miss Janice loves a covered porch with wicker rockers! Beautifully decorated front entrance...such a warm welcome for her guests! Awesome kitchen...I love the wall color, the cabinets, the countertops, the lamp chain covers, and all the decor. 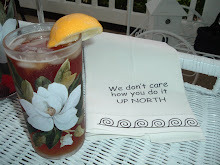 Simple dish towels...love the colors and the layering Miss Nancy! How darling is the little desk vignette...Look at the tassel, love that rooster, the wall treament, the damask file folders, the inititals, and the polka dot frame. Perfect, just perfect! Look at the dining table, obviously ready for a special event...what a gorgeous chandelier! Ahem...can you believe her master bedroom...right out of a magazine! 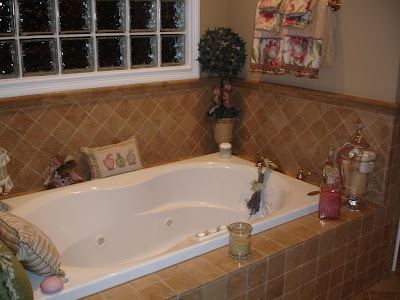 She has a beautiful color combination in her master bath! She has so much style...a beautiful chandelier, adorned with crystal beading and chic cheetah print shades. Ooh, look at this autumn vignette...why didn't I think of tying my favorite ribbon onto my pumpkins? I definitely will copy this next year! 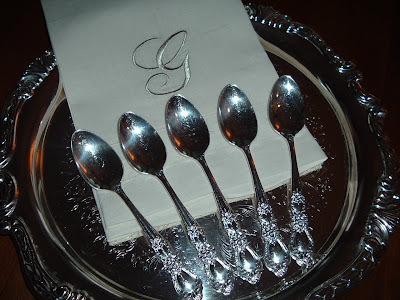 Cute tablescape...just dang cute!...Next year y'all! It must be so nice to walk into a kitchen and know that the lady of the house has it all under control...her Menu board..."Here's what y'all are having"! And she bakes, also! Good heavens, that cake looks delish! Look at this...a black and white toile pot! Now Miss Nancy, I likedta died when I saw this toile pot! As soon as I finish this post I'm gonna google "toile pots & pans." I just have to have this...just have to! She even loves Kitty Bartholomew...oooh, so does Miss Janice! 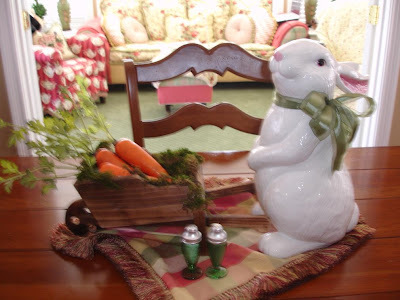 Look at this bunny in a vignette...pretty as a picture. Miss Janice loves people who love bunnies! 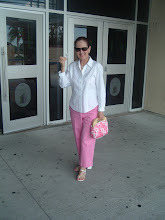 Miss Nancy, your blog is amazing...I get so much inspiration everytime I visit with you. Thank you for all that you do to inspire all of us! 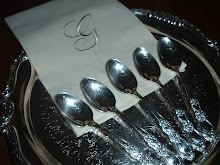 So...on that note, I think I simply must award Miss Nancy "Five Silver Spoons." Don't y'all agree? She deserves them! Congratulations Miss Nancy! Well, I sure hope y'all have enjoyed visiting Miss Nancy's home today. 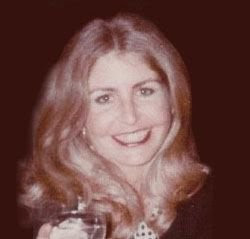 If you have never been to her site, be sure to drop by...she's ever-so gracious! 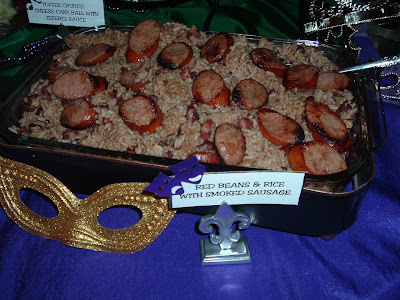 Let the Good Times Roll...Cajun-style! 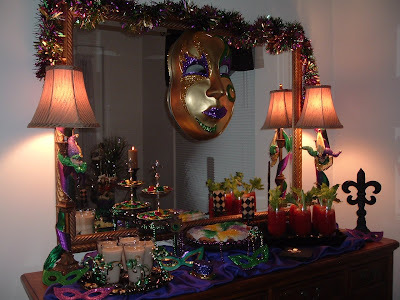 Today I'm featuring a tablescape for a Fat Tuesday Celebration. Fat Tuesday is held in New Orleans on the Tuesday before Ash Wednesday. It's called Shrove Tuesday and the name comes from "shriving," or purification through confessing one's sins prior to Lent. 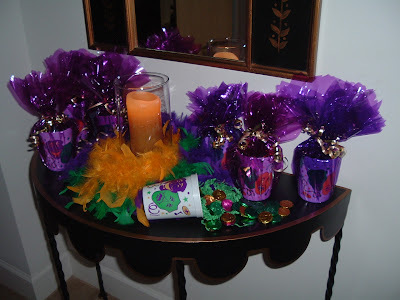 The colors of Mardi Gras are purple, gold, and green and I chose these colors for the tablescape. 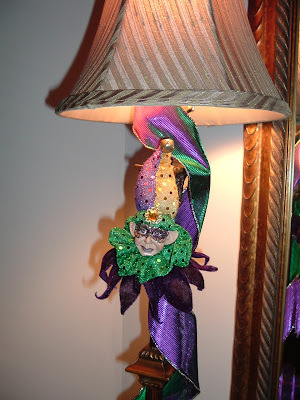 It is generally accepted that the purple stands for justice, the gold for power, and the green for faith. 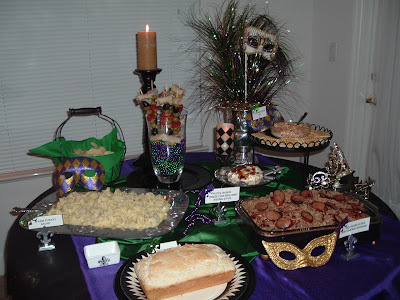 This is an informal, buffet-style setting; it's the easiest way to host this feast of traditional Cajun foods. 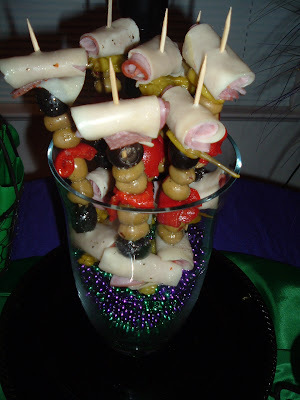 For appetizers, I am serving muffulettas...on a stick, instead of sandwiches. 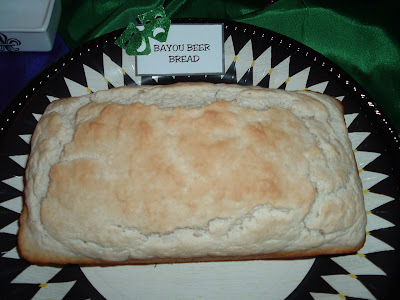 The muffuletta sandwich is a specialty and signature sandwich of New Orleans. This is my version and a much more festive presentation than the sandwich. 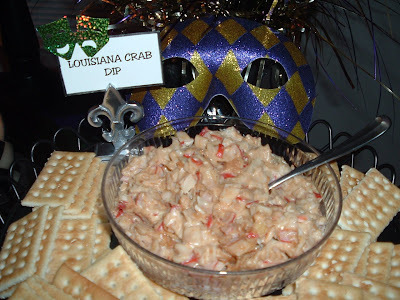 I'm also serving additional appetizers of Louisiana Cajun Crab Dip with crackers and a Toffee Crunch Cheesecake Ball with Jezebel Sauce, with Honey Grahams...a Southern favorite. 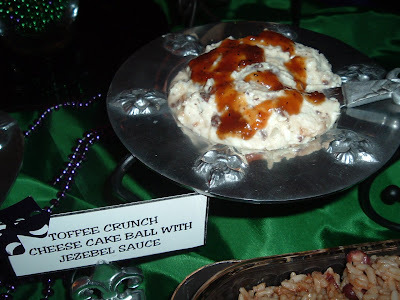 The Toffee Crunch Cheesecake Ball with Jezebel Sauce...So very Southern More traditional New Orleans favorites...Red Beans with Rice and Smoked Sausage. 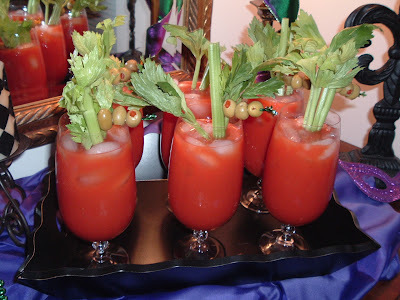 In addition to beer, wine, and sodas, I am serving my "signature beverage" of Virgin Bloody Mary's. 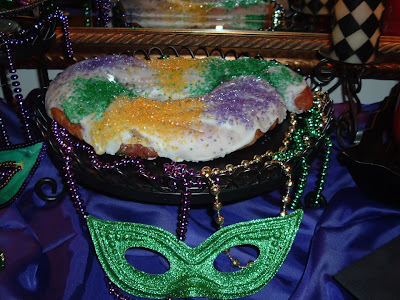 Of course, no Fat Tuesday party would be complete without a King Cake. 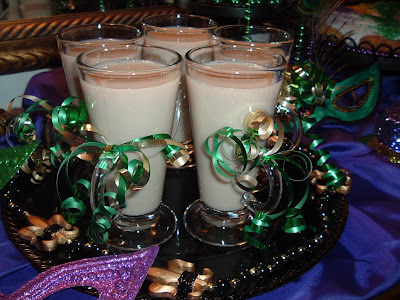 The King Cake is a New Orleans tradition that involves a pastry, a small plastic baby, and a party. 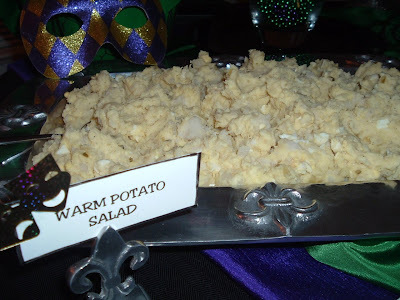 The King Cake is baked with the small plastic baby inside; the person who gets the slice with the baby inside has various privileges/obligations--my recipient will have to host the next party. 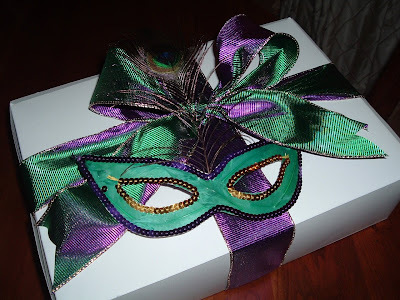 If you ever serve King Cake, be sure to tell your guests to inspect their piece of cake before they begin eating it! 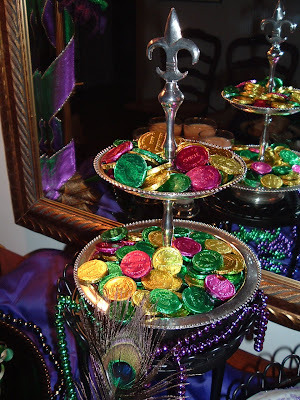 The must-have at any Fat Tuesday party...King Cake! With the dessert cake I am serving Chicory coffee. Chicory is everyone's favorite coffee in New Orleans and is available at gourmet grocery stores or online at Cafe du Monde. This coffee is made with a mixture of chicory--a flavoring that adds mellowness, body, and aroma to coffee. Add 1/2 of your regular coffee and 1/2 of ground chicory and brew as usual. Chicory flavored coffee may be served plain, or with hot milk. 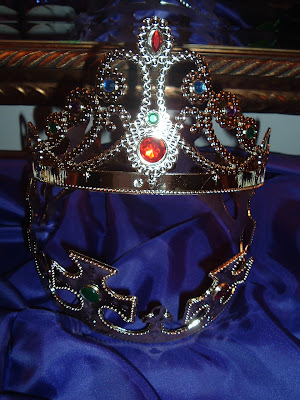 Now, you simply must crown a King and Queen at your party. 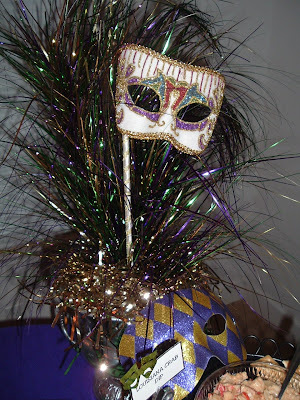 So, we will be playing a Mardi Gras trivia game and the lady with the most correct answers will be Queen and the gentlemen with the most correct answers will be King! Remember that presentation is everything...Make it Memorable. 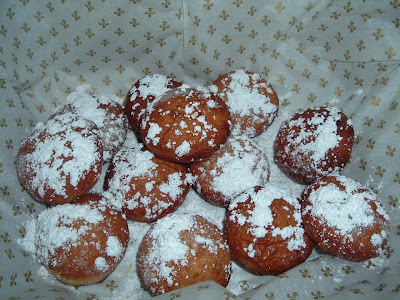 You can't have beignets without the chicory coffee...it's a tradition in the South. 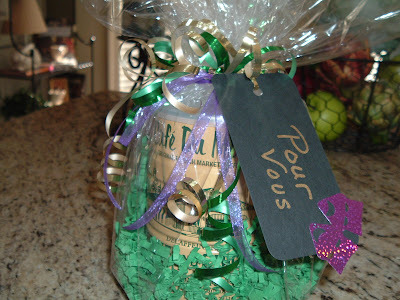 Here's a gift for the host--a can of chicory coffee, wrapped with green shred in cello, a festive ribbon, and a Mardi Gras themed gift tag, pour vous! Don't forget your party favors y'all! "Throw me something, mister"! 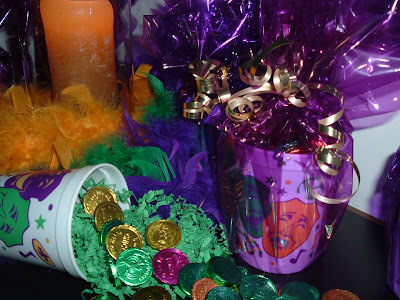 The doubloon (coin) is one of the most enduring symbols of Mardi Gras, so I packed each festive cup with candy doubloons and wrapped them in cello and tied it all up with ribbon--a favor for each guest--Making it Southern...Making it Memorable! I hope that y'all have enjoyed your visit with me today. Thank you for stopping by...I'm off to enjoy some Fat Tuesday fun! 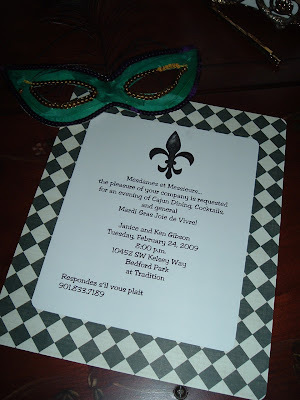 Does Miss Janice Use Paper Plates? Enough With Tea and Etiquette!